"You can't run through a camp. You can only ran because it's past tents." Almost pure stands of ponderosa pine cover much of the high country between 6000 and 8000 feet. Only in Arizona are conditions right for such a vast, pure ponderosa forest. The slender Gambel oak also grows in the ponderosa forest, favoring rocky outcrops. Another forest resident, the tassle-eared or Abert's squirrel, flirts its long fluffy tail at hikers as it scampers easily from branch to branch. You may also hear the harsh call of the Steller's jay, a large blue jay with a crested head. Flocks of tiny pygmy nuthatches roam the forest, settling in the tree crowns and working their way down the tree, inverted, looking for tasty insects in the bark. The information for this hike was extracted from Backpacking Arizona by Bruce Grubbs. Purchase the latest version of this book using the link below. 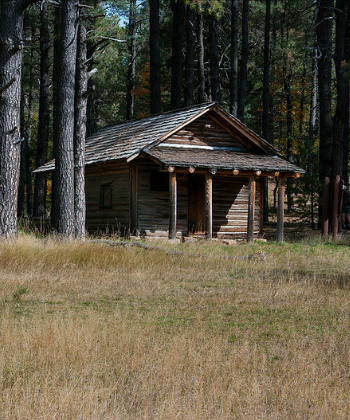 The relatively easy Historic Cabin Loop through magnificent ponderosa pine forest follows historic trails and features historic cabins and hundred-mile views from the Mogollon Rim. Please join me for a Memorial Day weekend backpack to this wonderful wilderness area. We'll start mid- to late Thursday morning on the 250-mile, four-hour drive up through Clints Well, AZ to the Mogollon Rim Ranger District office, stopping for lunch along the way. We need to arrive by mid-afternoon, to be sure the office is open. After getting whatever local info we need from the on-site Rangers, we'll find our campsite for the evening. One option will be the nearby Blue Ridge Campground. Other options are available. Our options for dinner are backpacking food or the like in camp, or a trip back down the road to the Long Valley Cafe. On Friday morning we've got about an hour's drive to get to our trailhead/parking spot along Forest Road 95. Leaving the Jeep, we'll walk uphill and connect with the U-Bar Trail on an old road. As we'll see, a lot of this hike involves following old roads. It's not nearly as bad as it might sound, though. There are also several places where we'll have to keep a sharp lookout for the trail. It can be a bit "iffy" in places. After following that first road, we'll continue on the U-Bar Trail down through canyons, up over broad ridges, and along more roads, draws, and canyons. After several miles, we'll reach the junction with the Barbershop Trail. There we'll turn west to Coyote Spring. Our first campsite will be just ahead. The Buck Springs Cabin is about one mile east of our campsite. Return to the trail junction and continue east for another three-quarters of a mile. This makes for a nice two-mile round trip afternoon walk before dinner. We've got a long day on Saturday, so we'll be sure to get up early to get started. Once we've had breakfast and have our gear repacked, we'll continue on the Barbershop Trail. There are several points in the next four miles where we'll need to pay particular attention to make sure we stay on the trail. We'll eventually pass Barbershop Spring before climbing to cross Forest Road 139 on a broad ridge. A short distance beyond the road, the Barbershop Trail ends at the junction with the Houston Brothers Trail. A turn to the south on the Houston Brothers Trail, followed by a couple of miles of ups and downs, will eventually bring us to the junction with the General Crook Trail at the Mogollon Rim. We'll stop on the Rim for lunch. After lunch, we have a four-mile stretch of hiking along the General Crook Trail/Rim Road. Then we'll turn right on the signed spur road to General Springs Cabin. From the cabin, go north on the Fred Haught Trail, which follows General Springs Canyon. This is also the route of the Arizona Trail. Our second campsite is along the creek just north of the cabin. We have a relatively short hike on Sunday, so we can relax a bit in camp before heading out. About two miles from our campsite, the Arizona Trail forks left and leaves the canyon. We'll stay right on the Fred Haught Trail. Once again, we have some ups and downs through Fred Haught Canyon, across more broad ridges, across Bear Canyon, and on to Pinchot Cabin. From there we have just another half-mile to the Jeep. This trip is planned for a limited number of only four or five people. There is no charge and no permit required for the trip. You will, of course, pay your fair share of travel expenses. You'll need food for three breakfasts, two lunches, and two or three dinners. The number of dinners depends on where we have dinner before starting the hike. Dinner on Thursday at the Long Valley Cafe reduces the number of backpacker meals to two. There should be adequate water in the different springs and creeks we'll pass along the trail. We'll definitely verify the water situation with the local ranger before the trip. The weather should be lovely on the Mogollon Rim this time of year. You can probably count on daytime highs in the 70s with lows in the high 40s. Our campgrounds are all near the 7,200 feet level. It'll be a bit cooler than Tucson, perhaps by as much as 20 degrees. Pay attention to the spot weather forecast using the link above. You'll likely be able to use a light bag, but may have to opt for a colder weather sleeping bag. Once we arrive back at the Jeep, we'll get out of our boots, change to cleaner clothes, and head out to the highway. We'll probably stop at the Long Valley Cafe for breakfast. If it's too crowded, we'll go on down the road.